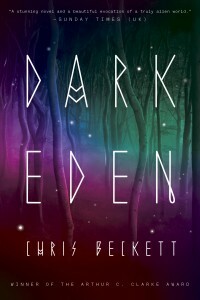 I’ve just received the book proofs of the North American edition of Dark Eden, looking very smart with its eerie new cover image of the sunless forest of Eden. And it’s now available for pre-order from Amazon.com and from Amazon Canada. A new US audio book version is also under way. I hope it’s really successful in the States and Canada – It’s a very special book and I absolutely loved it (I think I’ve told you this before). Thanyou Su. I have no objection to being told more than once!